The small wooden tables at Lankan Filling Station are set with spoon, fork and pencil, but really, you only need the pencil. This is food to eat with the hands, as you tear off a bit of crisp hopper and use it to dip into curry or scoop up fiery sambol​. Without the pencil, however, you're buggered, thanks to a fiendish tick-the-box menu/order form. I tried to sneak in a verbal order of murukku, that moreish mixture of crunchy sev and deep-fried pulses ($5) with my Colombo 7 gin and tonic ($10), but no. "Use the pencil!" For former Berta head chef, O Tama Carey, Lankan has been a long time coming, following two years of market stalls and pop-ups. Now, at last, her hoppers have a home – a long, narrow, squeezy space in Riley Street, just off William. 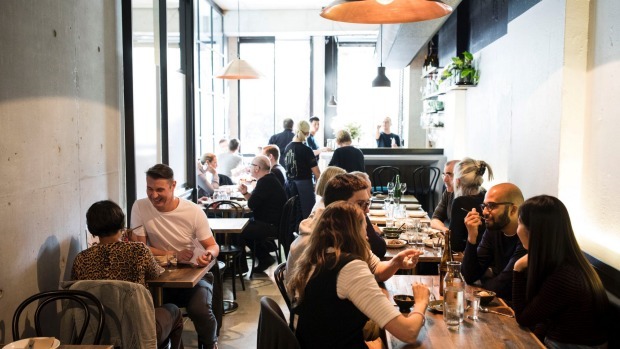 David Mitchell Architects has gone for bunker chic; all polished concrete, dark wood, and shelves of colourful spice jars, leading to a bustling open kitchen where Carey and head chef, Pinbone's Jemma Whiteman, fry hoppers and toast spices. 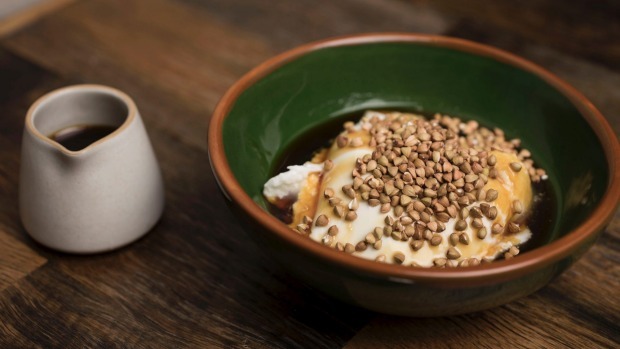 FYI if needed: hoppers are bowl-shaped pancakes made from a two-day ferment of coconut and rice flour. Acting like your bread, plate and cutlery in one, they are glorious things, from their lacy, crisp edges to their spongy, crumpety bottoms. 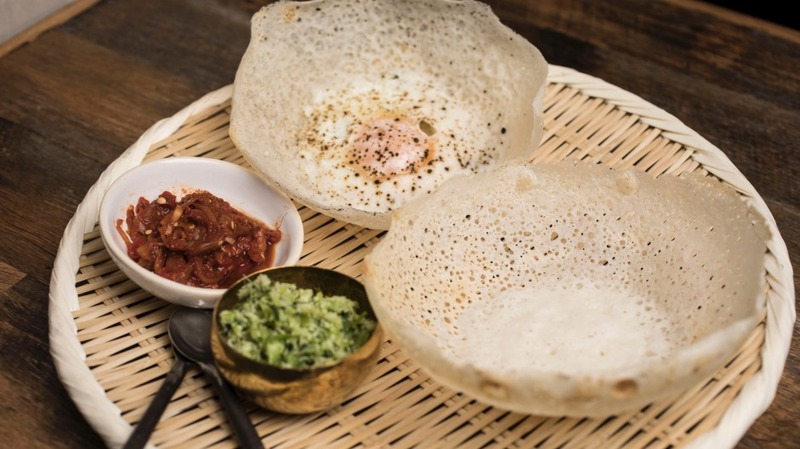 Make life easy and go for a hopper set ($18) of one plain and one egg hopper with two sambols on the side – perhaps green pol sambol of coconut, ginger and coriander and kata sambol of onion, chilli and lime. You'll be needing a curry – a nicely judged, three-chilli-rated, snapper curry ($18) and/or a hot-but-not-too-hot, four-chilli-rated red curry of roughly chopped chicken on the bone ($22), which has flavour to burn. String hoppers ($16) are something else again – delicate, flat, noodly nests like soft and steamy tangles of very fine rice vermicelli, which come with sambol and kiri hodi, a gentle comforting gravy with a slurry of onion to which you can (and should), add a boiled egg ($2). The floor team is hard-working and good-humoured, headed by sommelier Iris Rees, whose fun-times drinks list runs from a tangy sake/yuzu Yuzushu ($10) to a fresh and juicy, on-tap Sparrow & Vine sangiovese rosé from the Eden Valley ($9/$33/62). 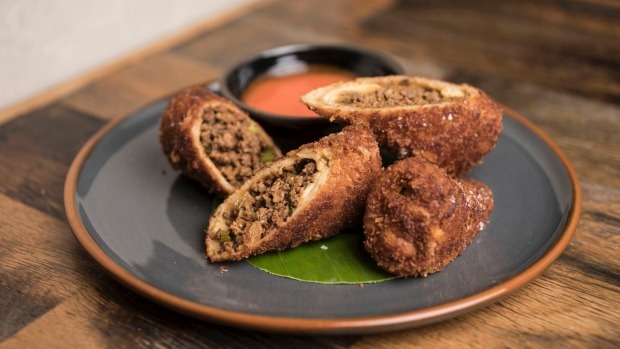 For extra thrills, add beef pan rolls ($6) of spicy, savoury mince wrapped in crepes, then crumbed and deep-fried, served with fiery fermented chilli. There's a lovely dish of sweet green cabbage mallung ($12), flash-cooked with turmeric, mustard seeds and coconut, and desserts run from a ho-hum labne-like buffalo curd with zingy kithul treacle ($8) to a refreshing sorbet of king coconut ($6). It's not easy to get your head around the menu, but it's a pleasure to deep-dive into the spicy warmth of Sri Lankan home cooking in such a sweet and super-casual spot. I like the balanced spices, the curry leaves in everything, the way dishes flow into each other at the table and the this-is-how-we-like-to-eat aesthetic behind it all. I also like that it's not a pop-up, that there's commitment to the relationship. 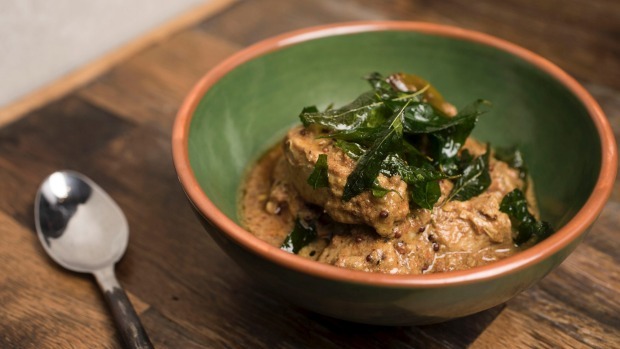 Lankan has arrived on the scene at a good time, joining a growing breed of small, independent restaurants that marry the traditional and the contemporary to create something new for now. Drinks A fun list of Sri Lankan teas, Young Henrys beer on tap, natural wines, Ceylon arrack and even mead. Vegetarian All hoppers, most sambols, most sides, two snacks, two curries. Go-to dish The hopper set: one egg hopper, one plain hopper, two sambols, $18. Pro tip When in doubt, sign up for the $60 banquet menu.